The only thing that could possibly be better than food on a stick, is food in a cone. It comes with all the same no-mess convenience as food on a stick, except with even more tasty goodness crammed inside. While normally reserved for frosty treats like ice cream and snow cones, pizza now comes in cone form. 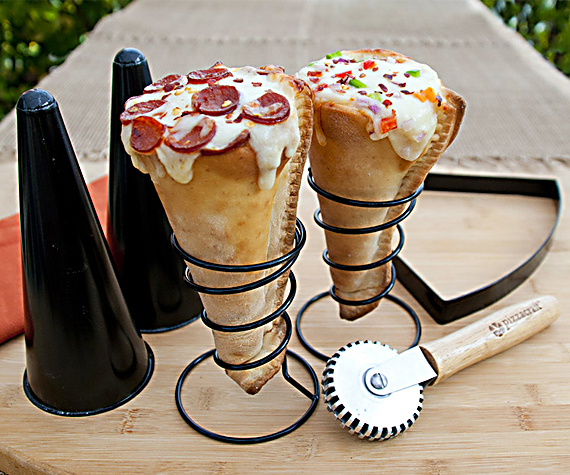 If you’re not lucky enough to live near a restaurant that has picked up this trend, you can make your own with the Pizzacraft Grilled Pizza Cone Set. The kit includes non-stick molds and stands so you can work your pizza dough into a cone shape and bake it in the oven. Once you’ve baked the cone/crust you can fill it to the brim with sauce, cheese, and other toppings, or in this case, fillings.